Time to Stop "Cutting & Suturing"? Patients (and friends) often ask me which sunscreen they should use. Often this is more for skin aging protection than sunburn protection. The answer is the same. The best sunscreen is the one they will use. It has to "feel" good to them--not be too greasy, not have the wrong scent, be the right consistency (lotion vs cream). It will not matter if it is SPF 15 or 3o if it never gets used. The next thing I tell them is to use it daily, all year around, especially on the face and neck. If they are in the habit of applying sunscreen to their face daily (even on overcast days), it won't be forgotten. For a more scientific answer, you need both UVA and UVB protection. It is the UVA rays that are most responsible for wrinkling and aging the skin. It is the UVB rays that are the most responsible for the sunburn. The best sunscreen is at least an SPF 15 and has a sunblock component also. The SPF rating reflects the product's ability to screen or block UVB rays only. SPF 15 blocks approximately 93 percent of all incoming UVB rays. SPF 30 blocks 97 percent; and SPF 50 blocks 99 percent. To protect against the UVA rays, the product needs to have avobenzone (Parsol 1789), ecamsule (Mexoryl), titanium dioxide, or micro-zinc oxide. Apply the sunscreen 20-30 minutes before going outside. Use enough. To ensure that you get the full SPF of a sunscreen, you need to apply 1 oz – about a shot glass full. Reapply after getting out of the water or toweling off. Even "water-proof" sunscreens are not usually "towel-proof". Reapply every two hours when outside at a beach, etc. for adequate protection. Use even on a cloudy day. Up to 40 percent of the sun's ultraviolet radiation reaches the earth on a completely cloudy day. Shield your eyes with UV-blocking sunglasses. Squinting caused wrinkles around the eyes. The UV rays can cause cataracts. Wear a wide-brim hat to help protect your head & neck. Don't forget to apply lip balm with SPF 15 or higher. The Skin Cancer Foundation grants its Seal of Recommendation to products that meet the Foundation's criteria for effective UV sun protection products. If you use a product make especially for the face (ie MD Forte Total Protector SPF 30 or Clinique's Super City Block Oil Free Daily Face Protector SPF 25) it will be less likely to cause skin irritation or acne outbreak with daily use. So spend more money on the face and then if you need to save money, do so on the body sunscreen (ie NO-AD SPF 30 Sport Ultra Block Lotion, Coppertone Water Babies Sunscreen SPF 45). Most of us have too much paper work these days. There are patient notes to write or dictate, then review and sign. Operative notes. A letter to the patient's insurance for pre-determination/pre-approval of a procedure. Followup on said letter. Insurance billing statements, quarterly tax reports, etc. There are hospital privilege renewals, FDA license renewals, business property assessment forms, etc. Most of it is not fun by any stretch of the imagination. In quilting, there is a technique called paper piecing. This is paper work that can be fun. It helps to get "points" sharp when dealing with triangles as in my Flying Geese or the Thanksgiving Star pattern or the New York Beauty pattern. It works well for pictorial blocks or the more complex circular Flying Geese. If you want to learn how to draft your own patterns, start simple. There is an order to which pieces are sewn first. More complex pictures/patterns may need to be done in sections and then sewn together. Shorten your stitch length on your sewing machine. This makes removing the paper when you are done much easier. Try it sometime. This may become paper work you enjoy. "Here is a picture of my groceries from food shopping this morning in our improved all purpose QOV wartime-shopping bags. These polyproplyene mesh bags are kind to the environment while being very strong and sturdy. They hold a ton of groceries (imagine how many fat quarters that would be!) and you don't have to worry about plastic bags breaking or more importantly cluttering up our landfills and countryside. These bags are identical to the grocery bags sold at Whole Foods Market except for the color and our logo. I figure 4 bags are what most families would need to carry all their groceries. To show you how much I believe in these bags, I am offering them at a rate you won't believe. You can buy 4 for $29.99 which includes free shipping! I have fielded several calls in the last few days from individuals who want breast reduction surgery. Yes, they want their insurance to pay for the surgery. And yes, often insurance will do so. But as we have all come to learn, patient's (I for one refuse to call their insurance company for them prior to their first visit.) must first answer certain questions. What kind of insurance do you have? Medicare, BCBS, or XYZ This doctor does not accept Medicare or Medicaid. Do you know if your insurance covers breast reduction surgery? Some have it written in their policy that all breast surgery, except for breast cancer surgery, is considered cosmetic. No If your insurance doesn't cover breast reduction surgery, this would mean that all the costs would be yours. Do you know if you have out-of-network benefits? No or Doesn't she accept XYZ This doctor is out-of-network for all insurance companies, but will help you file. If you have no 0ut-of-network benefits, then it will be as if you have no insurance if you see this doctor. So may I refer you to someone else whom I believe is in your network. If so, do you know if you need to get a primary care referral first? No or My doctor gave me Dr. Bates' name If it is an HMO or PPO, some require this first. May I suggest that you call your insurance company and find out the answers to the above questions before we make your appointment? Having been outside more lately, as the weather has gotten so much nicer I have also noticed more ticks. I believe that prevention in medicine is to the act of doing something (change diet, not smoke, use condoms, etc) to avoid the need for treatment of a disease (heart disease, emphysema, HIV). So I would encourage all or you to take the proper steps to prevent Lyme's Disease and avoid the need for treatment. The "preventive" steps to take are to either avoided the tick-invested area or used a DEET or permethrin-based tick repellent and then doing a body check for ticks that same evening. According to the Center for Disease Control it takes 36-48 hrs for transmission of B.burgdorferi or B. microti to occur from an attached tick and not all ticks are infected. Therefore, a tick bite does not necessarily mean a person will get infected. Prompt removal of the attached tick will reduce the chance of infection. I walk my dogs daily in the woods nearby. My dogs are protected with Frontline. I use Deep-Woods Off and often wish I could use Frontline. That would be so much simpler, apply once monthly. Don't forget the sunscreen and wide-brimmed hat. Protect yourself, then get outside and enjoy life! It will have been 4 years on May 30th since LadyBug was euthanized. She had osteosarcoma of the left maxilla. 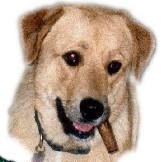 And no that isn't a cigar in her mouth. It's a rolled up rawhide treat. LadyBug was half-Rottweiler and half-Pyrenees. She was nearly 8 years old when she died. She was a charmer! She would sit with her hunches on the sofa and her front legs on the floor. She is missed. The origins of the phrase "hair of the dog" seem to go back to "the Romans and many ancient peoples before them believed that like cures like. They would bind the hairs of a dog that had bitten someone to that very person's wound to make it heal better EVEN of the dog was rabid." It then morphed into referring to handover cures (no "hair" included in these). Another use for the hair of your dog is to make something from it. Depending on your own dogs breed (and the Pyrenees is perfect), your dog may have wonderfully full, soft hair. Years ago while walking through 'Books-a-Million', a book caught my eye. The book was "Knitting with Dog Hair" by Kendall Crolius. It described the steps needed (comb and keep the hair in a dry paper bag until you have enough, spin into yard, and then knit). VIP Fibers provides the service of preparing the hair after you collect it. I saved the hair from LadyBug and my two labradors, GirlFriend and Columbo (who died in November 2003 from an abdominal cancer at age 11). I have a lace shawl from their hair. It feels like mohair. I spent the last few days piecing this quilt top (50" X 70") which will be sent to someone who will do the actual quilting (putting the layers together--top, batting, and backing). The finished quilt will then be sent to a wounded soldier. This is done through a group called Quilts of Valor Foundation. The organization was begun by a nurse, Catherine Roberts, in Delaware. My sister-in-law (who is married to my husband's brother, an army Chaplain) told me about the group. It gave me a place to send my pieced tops (having made all the nieces and nephews a quilt each). The group is non-political. We don't take sides as to whether we should be in Iraq, Afghanistan, etc. We simply try to provide some comfort to the wounded soldier and his/her family. I thought this might be a nice way to spent Memorial Day, thinking about our soldiers. My father and older brother were both in the military when they died (both of motor vehicle accidents, not war). I have no immediate family member (other than my brother-in-law, Bart Herndon) who is involved in the military at this time. I am thankful that he is safely on American soil. He spent a year in Iraq and has been state-side now for a couple of years. This quilt top used a variation of the pattern called Rail Fence. I use five "planks" rather than just three. 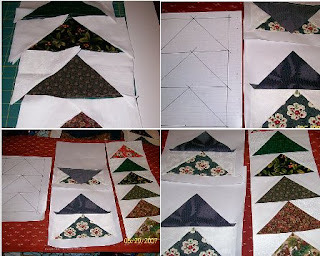 For the above quilt top (50" X 70") each "plank" is 2" X 10" (without seam allowances). I like how quickly it goes together. I like the zig-zag design that forms. It works well with both planned colors or with scraps. Just be sure to have a good light to dark transition. I have done several with this design. Simply said--I am for piece (peace). The two best sites I found were the American Pharmacy Association and the White House Drug Policy. Both of these give clear instructions. There was an article in USA Today recently highlighting the increasing problem of older drivers. It is not something most of like to think about. I do not like even being without my car for a day while it is being serviced. It is difficult to think about giving up the freedom and independence and self-reliance that comes from being able to drive. But that's the real point, isn't it? Being able. As difficult as that is to fathom, I find it as difficult, maybe more, to imagine not being able to operate. Yet for me, patient safety is the major issue. Patient safety is first. Not my ego, not my self-worth as defined by my profession. Still, I am human and those things do raise their heads when making choices, don't they? So when is the right time for a surgeon to call it quits? Why not put the surgical age of retirement for the attending surgeon at sixty and the physician at sixty-three or sixty-five, as you think best? I have an idea that the surgeon’s fingers are apt to get a little stiff and thus make him less competent before the physicians cerebral vessels do. However, as I told you, I would like to see the day when somebody would be appointed surgeon somewhere who had no hands, for the operative part is the least part of the work. Then, of course, many of us may get vascularly speaking, a little inelastic well on this side of sixty, or may remain in this respect as youthful at seventy as are others at fifty. This is all a lottery of inheritance and habits, and I shall be very glad, for one, to have legislated to stop active work at sixty.»Letter to Dr. Henry Christian, November 20, 1911. I once asked a friend of the family, an ophthalmologist in his 80s who had retired, how one decides to stop operating. He said simply, You will know it if you listen to yourself. And that is the key. Listen to yourself. The decision is ultimately yours to make. One should not be afraid to do something for oneself. It is hard to accept that fact because for decades our role as physician has been to exert ourselves for others even though, of course, we benefit. Retirement, furthermore, does not mean the end of being altruistic. There are many opportunities to make the world a better place and not just for oneself or one's family. Another fact, unpleasant to mention, is that some surgeons, as they age, lose their manual skills, their surgical judgment, and their will to learn new things, to keep up with the times. When an opera singer is over the hill, it is apparent to everyone. A surgeon can hide it longer, even though the patient may be the first to experience the consequences of that surgeon's diminishing skills; nurses and colleagues may know it but fear telling the surgeon, although they may stop sending patients and family to him or her. Remember: a tenor who sings off-key harms nobody but not so the surgeon who functions suboptimally. My former chief, Dr. Francis D. Moore, once remarked: Nobody over 70 should be sticking a knife into anybody else. While one might disagree with the specific age, it does make a point (no pun intended). Furthermore, there are some surgeons who should have stopped many years before they ever reached 70. So just like I hope I give up my car keys before becoming one of those elderly driver/accident statics, I hope I give up my scapel before I harm anyone. I hope I will know when that time comes. I have been working on this applique quilt top for a while now. It keeps getting put aside as a piece another QOV top or make another baby quilt for a friend. This top/quilt has no deadline. Sometimes that is a lovely thing. Sometimes a deadline will help motivate me, as it does others. I'll finish it someday, even if it's years from now. I enjoy making these ruches roses, but I must admit I don't really enjoy making the leaves. Each ruched rose takes approximately 200 stitches. Each one can easily take an hour to make before stitching it to the background fabric. The instructions for making a ruched rose can be found in American's Heritage Quilts published by Better Homes and Gardens, 1991. 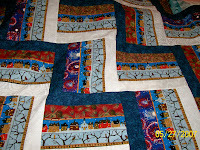 I think I am more a piecer than appliquer at heart though I love appliqued quilts--Baltimore Album quilts, Hawaiian quilts. 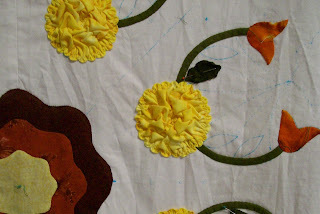 I enjoy using the rotary cutter to "mass" cut pieces which I can't do when I do applique. There's that cutting and sewing that quilts and surgery have in common. Don't have to finish a quilt in one sitting, as I do any surgery. That makes it much more relaxing. Veterinarians are beginning to do DNA testing in "mutts" to determine the breeds that formed there unique makeup. This is done to aid in treatment of the dog as some diseases are seen more commonly & /or not at all in some breeds. This got me to wondering why humans are not labeled in terms of breeds like other mammals. The different breeds of dogs may include doberman, german shepard, poodle. Horses may be pintos, mustangs, Arabian, etc. Cats may be Persians, calicos, etc. So why aren’t we labeled that way? My breeds would be Anglo-Saxon with some American Indian (if family history is correct). Tiger Woods would be from the breeds: "Woods once told Oprah Winfrey that as a child he had decided he was "Cablinasian" -- a mixture of Caucasian, black, American Indian and Asian. His mother Kutilda is from Thailand, his father is an American of multiple ethnic backgrounds." Just like our fellow mammals, some diseases are more prevalent in some of us than others. We know for example that sickle cell anemia is not typically seen in Anglo-Saxons but is common in Africa, South or Central America (especially Panama), Caribbean islands, Mediterranean countries (such as Turkey, Greece, and Italy), India, and Saudi Arabia. In regards to the disease cystic fibrosis, if your family background is not white, your chance of being a carrier is less than 1 in 30. For example, some Asian-American groups have carrier rates of 1 in 90. Would it be better labeling ourselves as different "breeds" of humans than races? Would it take the political/historical bias out of the label? Could we then talk more freely about the connection and treatment of diseases associated with certain "breeds" without fear that we would offend someone? Yesterday and today the Arkansas Mission of Mercy provided (is providing) "free" basic dental care to anyone. No one is checking economic need. It is first come, first served. I want to applaud my dental colleagues. I wish there was a way to convey to those who are served that this is only "free" to them. Several companies underwrote this venture (in this case--Arkansas State Dental Association, Delta Dental of Arkansas, the city of Little Rock, Baptist Hospital, Cysco Food Services, Patterson Dental Supply, Sullivan Schein Dental Supply, Clear Mountain Water, the Arkansas National Guard, Arkansas Southern Baptist Convention, Arkansas Children's Hospital, Kroger, Subway, McDonald's, and the Arkansas Pharmacists Association). The dentists, assistants, and others are giving of their time and talent. The dentists were also encouraged to provide extras: "In addition to your participation, ArMOM needs donations of ‘gently used’ (remember—you might have to use them) operative and surgical hand instruments, extraction elevators and forceps, curing lights, ultrasonic cleaners, cavitrons, and amalgamators. We will also need syringes, gloves, masks, gauze sponges, burs, and operative restorative materials." Like every other business, we can not be there to provide our services if our overhead and expenses (you know what they include--business license, malpractice insurance, office rent, utilities, staff salaries, etc) can not be meet. I am simply a small business owner who wants to take home a fair wage. I wish I could (Utopian universe) provide my skills and services with no thought of those pesky expenses, but alas I have not discovered how to do so. So instead of listening to music while cooking, relaxing, maybe try a little poetry. I am new to this world of blogging. I must admit I enjoy reading them. I will try not to be too dry as I learn this skill/art.